Get a Free Copy of Monsters Inc.
For a limited time, receive a free digital HD Copy of Disney Pixar’s “Monsters Inc.” Receive your free copy today when you connect your Amazon Video Library to your Disney Movies Anywhere account. This offer ends at 11:59 p.m. (PT) on Monday, October 5, 2015. 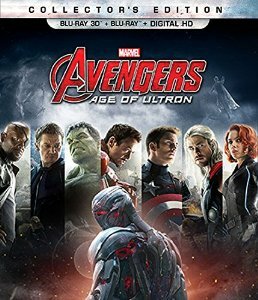 MAYBE that means that as long as you add Avengers: Age of Ultron to your Disney Movies Anywhere account by October 5, 2015, you get the free copy of Monsters, Inc. Caveat buyor: I don’t know. I’m sorry. I’m getting older and the world is confusing to me. There’s something called an iPencil. This is an actual product. Are these topics related? Not at all. Unless you look at it this way: the world is confusing me. But at least I have The Avengers. Or I will in October. The Blu-Ray Collector’s Edition includes a 3D Blu-Ray disc, a Blu-Ray disc, and a digital HD copy you can watch on your favorite device. Note on the image above: “I” did not take the pic. Someone on Wikipedia did. Thank you to them for doing so.